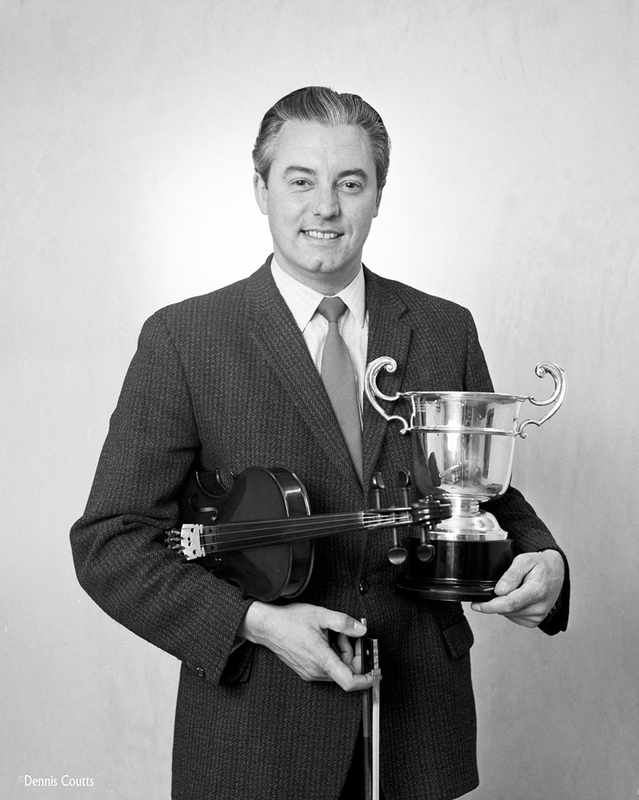 The son of a fiddler, born into a family steeped in fiddle music, Willie Hunter was widely regarded as the finest Shetland fiddler of his generation. While he was an accomplished dance band player and a founder member of the legendary Hamefarers, it was as a composer and supreme interpreter of slow airs that he is best remembered. In his later years he also delighted in passing on his skills to a younger generation of players. Willie Hunter Junior (as he was known, to distinguish him from his father, a blacksmith and also a fine fiddler) was born in Lerwick in 1933. He is said to have first picked up a fiddle at the age of three, and in later childhood used to take it to bed with him at night in case he needed to catch up on something he’d learned that day. He received his initial grounding and much encouragement from his father then, at the age of 11 started studying with Gideon Stove, Shetland’s long-standing music master and for many years leader of the first Lerwick orchestra, and also took lessons in classical technique from Geoffrey di Mercado, whose teaching helped him develop his fine tone. On leaving school, he initially joined his father’s smiddy, but there wasn’t enough business to support the two of them, so Willie Jun. left (arguably escaping the occupational hazard of deafness which eventually blighted his father), served his national service with the RAF and worked as a car salesman in London, before returning to his native isles, where his various occupations included his own laundry business, managing a knitwear factory and later teaching fiddle in schools throughout Shetland. All the while he was honing his craft, and his reputation, as a fiddler. In London he played frequently with the famous jazz-influenced guitarist from Yell, Peerie Willie Johnson (whom he’d first met at sessions in Billy Kay’s music room in Lerwick), and the pair of them appeared at the Festival and Albert halls, as well as recording for the BBC. Among his early musical influences were distinguished Scottish North-East exponents such as Hector MacAndrew and Angus Fitchett, the Irish wizard Sean McGuire and visiting top dance bands such as Jimmy Shand’s and Bobby McLeod’s. This was before Shetland fiddle music had embarked on its renaissance, and in the mid-1960s, Willie helped establish the Hamefarers dance band, which also included such eminent Shetland musicians as Ronald Cooper and Jim Halcrow on accordions. He also played frequently with other local dance bands, the Milk Shakes and latterly with the renowned Cullivoe band. In the Eighties, he played increasingly with the well-known Lerwick pianist Violet Tulloch, and his musicianship was appreciated by wider audiences when the pair of them appeared in some of fellow-Shetland fiddler Aly Bain’s TV series, such as Down Home, Aly Bain and Friends and The Shetland Sessions. His widening fame saw him teaching and adjudicating at fiddle events in the United States and he also travelled as far east as Japan to perform. After retiring, he threw himself into teaching, describing himself as “the happiest man alive” as he passed his art on to new generations of Shetland fiddlers. He could drive as hard as any of his peers on a Shetland reel, but he became pre-eminent as a master of the haunting slow air, including fine examples he composed himself, such as the beautiful Da Love o’ da Isles and his best known composition, Leaving Lerwick Harbour. His compositions, however, also included such enduring up-tempo tunes as the reel The Cape Breton Visit to Shetland and Da Sooth End jig. Willie Hunter succumbed to cancer in January 1994, a few days short of his 61st birthday, but not before he transcended the pain of his illness, spending much of his last few weeks in Billy Kay’s basement music room in Lerwick, determinedly recording his music with accompanist Violet Tulloch and the support of his wife, Pat. The result, later released on Greentrax Records as the album Leaving Lerwick Harbour, sold out its first 2,500 copies in little more than a week, the title track, his most famous air, played with immense depth of feeling by a master fiddler who knew that he was indeed leaving.